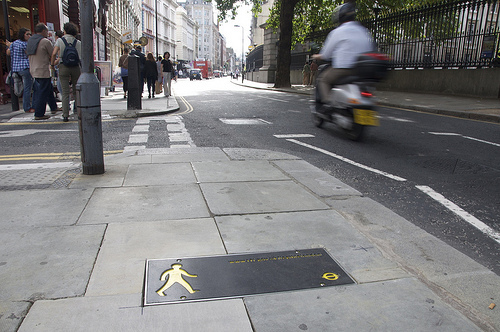 A series of pedestrian-friendly maps placed in strategic decision-making spots around London encourage commuters to choose walking over other modes of transit. Photo by Charlotte Gilhooly. 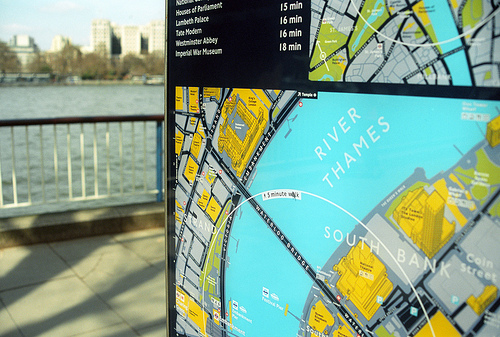 Transport for London (TfL), the government body in charge of Greater London’s transit system, installed pedestrian-friendly maps in strategic decision-making spots, like subway entries and bus stops, to encourage walking. In addition to being a healthy and environmentally friendly mode of transport, walking can also help commuters save time. “109 journeys between neighbouring central London Underground stations are actually quicker than the Tube,” TfL’s website says. The “Legible London” campaign operates on two key facts derived from a 2006 study: 1) walking can lead to major benefits for the transport system, economy and public health, and 2) predictable, consistent and authoritative public information is the key to building pedestrians’ confidence. In response, the study proposed two recommendations from which the “Legible London” project was born. The first recommendation was to establish a wayfinding system that supports “mental mapping,” the process by which we interact with our environment. The second recommendation was to create a central, dynamic map that could provide the basis for other printed maps and signage, ones that can be altered based on geographical factors. The second recommendation also includes making the maps and transit information available to public through various technologies. You can download the study here. 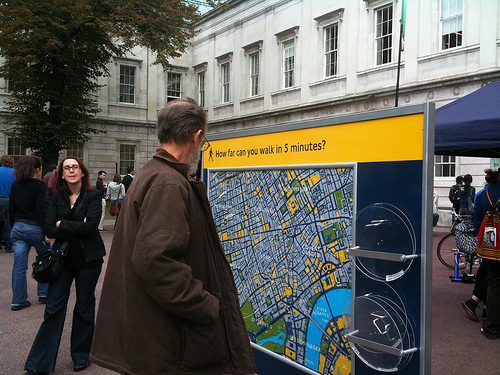 "Legible London" maps include 5-minute and 15-minute walking circles, to help pedestrians decide if walking is a better travel option. Photo by rbrwr. The maps separate the city into three categories and provide landmark prompts to aid in the development of natural mental maps. According to the website, these are the categories: area, for broad areas of the capital; villages, which make up an area and refer to places like Covent Garden; and neighborhoods, which make up villages. Covent Garden, for example, is made up of several neighborhoods like, Seven Dials, Neal’s Yard and Long Acre. The project was also careful in establishing accessibility for all, including information like pavement widths, steps and pedestrian crossing to ease mobility for wheelchair users. In addition, signage for wheelchair users was placed 35 inches to 70 inches off the ground for easy reading. The maps have some interesting elements, one of which is their orientation to the environment. Instead of using traditional north, south, east and west indicators, the maps use a “heads-on” orientation. This means that the maps are oriented to face the same direction as the user is facing, which makes it easier to associate yourself with your surroundings. The maps are also divided into categories of Planner and Finder. The Planner map outlines the locations you can get to within a 15-minute walk. The Finder serves the same purpose for areas within a 5-minute walk. In comparison, the Finder is also more detailed than the Planner, with landmarks and 3D-illustrated buildings. Both maps make a point to integrate all modes of transport to help with travel planning and provide an alphabetical list of street names, to help people locate individual streets. The project came to fruition after a pilot evaluation with rave reviews and positive feedback. According to the project website, 87 percent of 1,000 participants supported the integration of the maps across London. Pedestrian satisfaction with wayfinding improved by 22 percent and more than two-thirds of the participants felt satisfied with finding the shortest route for their journeys. Most importantly, participants strongly agreed that this new system would encourage them to walk more often, walk farther and choose walking in place of other means of traveling. As for the time it takes to travel, pedestrian journeys were 16 percent quicker on average due in large part to the maps. Complementing the maps are easily recognizable signs across the city to direct pedestrians towards their destination. Photo by moleitau.